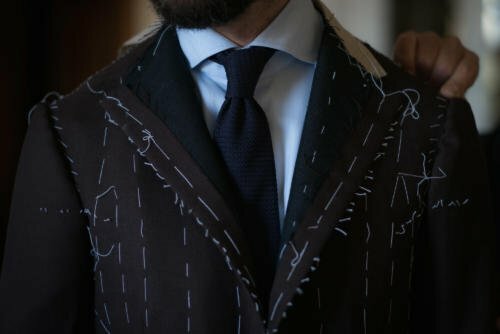 It’s been interesting to watch in recent years how more and more small tailors have come to prominence, getting coverage and an international reputation with remarkable speed. Everyone loves a new name, and social media spread it faster than ever. 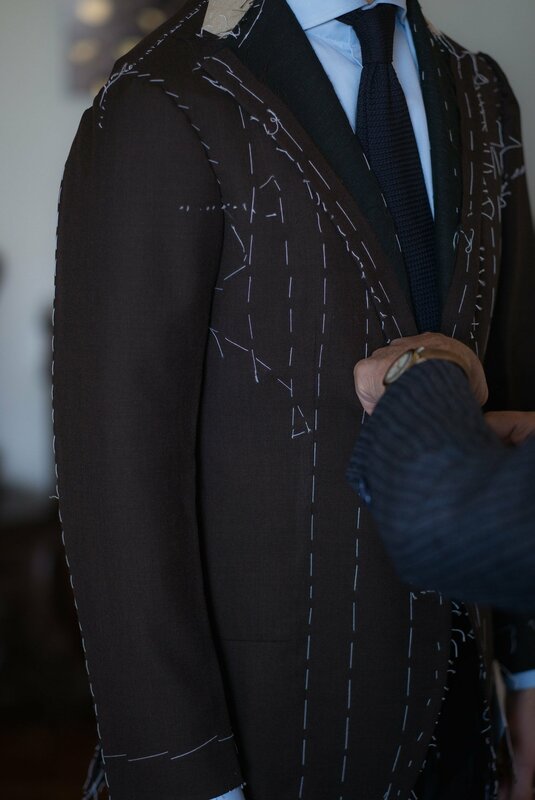 Of course, bespoke tailoring is a long game. It has awful margins, requires large fixed costs, and these days involves a lot of travelling. The reward, if there is one, is in the long term. The stability of a loyal clientele with a large disposable income; the ability to pass that clientele onto the next generation. I really hope, then, that being the latest ‘internet sensation’ does not prove to be more of a curse than a blessing for anyone. That any of those sensations flare up and fade away, perhaps even damaging some of the reputation of bespoke along the way. Sartoria Dalcuore is one of those recent growth stories. Although they’ve been working with people like George Wang at Brio for a few years (on both RTW and bespoke), the team has only recently begun travelling, seeking out the big markets in London and New York. Dalcuore, like many Italian tailors, was founded after World War II – in this case a little later than some, in 1966. Luigi (Gigi, pictured top) was an apprentice at Del Duca, as well as working at his aunt’s dressmakers. Gigi founded his own shop at the age of 26. That could be reassuring to any new cutter deciding to start out on his own, until you realise he started apprenticing at 16. Ten years is still really the absolute minimum of training and experience. I took the opportunity to try out Dalcuore during their first trip to London back in December (they’re here again from the 18th of February, and in New York from the 24th). We then had a fitting in Florence during Pitti (pictured here). The signs were good. The trousers were too tight around the seat and a little short, but the jacket was very good for a first fitting, and the pitch of the sleeve absolutely spot on. The cloth helped – a high-twist summer cloth from Holland & Sherry in dark brown. I’ve wanted a summer suit in this shade for a while, and it will look amazing with a white shirt, monochrome tie and polished black oxfords. 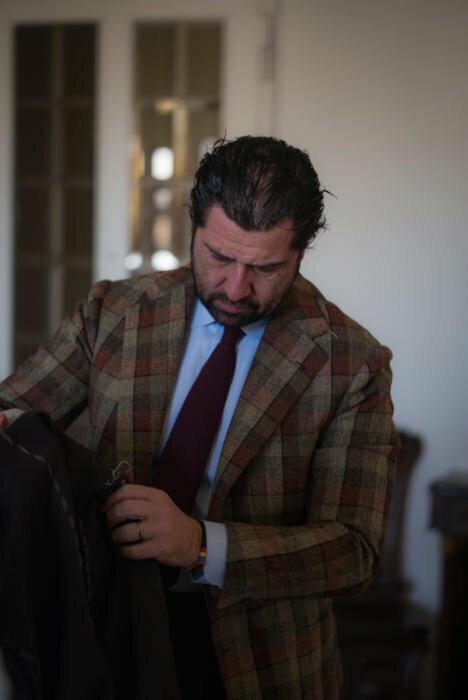 In terms of cost, Dalcuore sit between Solito and Caliendo – the other two Neapolitan tailors I regularly use. Their suits start at 3000, 2500 and 3500 euros respectively. On first sight, that looks like very good value. One tailor you hope will flare up and stay there. You can follow the discussion on Sartoria Dalcuore bespoke, brown high-twist suit by entering your email address in the box below. You will then receive an email every time a new comment is added. These will also contain a link to a page where you can stop the alerts, and remove all of your related data from the site. unrelated question: what do you think about Bucklebelts like the Hermes ‘H’ belt for casual wear? Can they ever benefit a classical look, or do they just seem pretentious? Even though I would never think of wearing such a belt with a suit, I am noticing many men that are doing so recently, I find it completely destroys the elegance of a bespoke suit. What do you think? I would never wear a belt with a logo on it though…. Not my cup of tea, but increasingly popular in markets where brand “statements” are more common and important, so middle and far east are big markets. Just a quick note to say how much I enjoy your site. Over the years I have had a fairly mixed experience with bespoke clothing but am currently looking to have a fully lined hopsack jacket made for the summer. As I live close to Tim Everest’s workshop I thought I might go with them. I notice that you have had several suits made by Tim and wondered what your thoughts were. Many thanks, pleased you’ve found it useful. Nice shade Simon. When can we expect a pinstripe suit from you? Not a big fan of pinstripes, given they are so much narrower in application, mostly only suited for business. It’s entirely bespoke. No fusing, hand-padded chest, lapels and collar. Following up on the question above, actually the fact that the lapel does not show the padding stitches is confusing. Do you know why that is? I have no doubt this is a truly bespoke suit with a hand padded lapel but would like to know why is it that the lapels look black and smooth as opposed to having the usual light color canvas with contrasting triangular shaped padding stitching that you see in basted fittings. I believe the canvas was just loosely basted on the outside at this stage, rather than being padded through. I’ve checked the jacket and you can see all the usual pinpricks of hand padding on the underside of the lapel. I love the top coat in the first picture. Have you any details on it – a great louche look. Please do – the colour is also fabulous. It looks to be a very versatile piece. 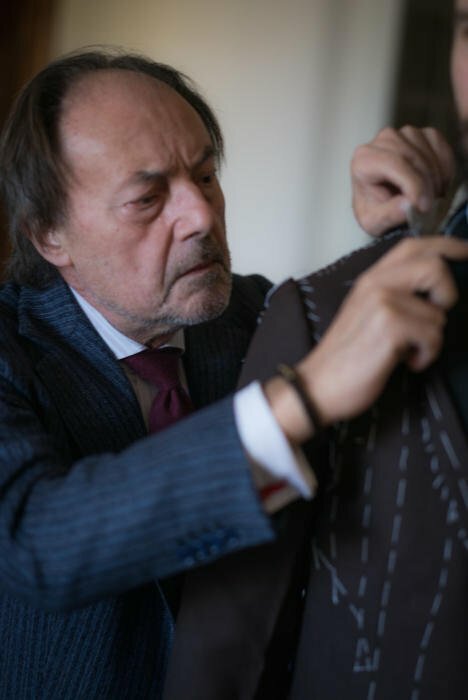 The sad thing is that Italy was plenty of tailors doing real bespoke at different levels and different rates and bespoke was available to ordinary people. Until 10/15 years ago a school teacher or a civil servant was able of wearing bespoke. It was like going to the restaurant: you go to the one you can afford but it is a restaurant and not a fast food chain. Now bespoke is becoming available for few (not necessarily the ones with proper taste). I feel admiration for the Italian tailors who take the suitcase and the samples of fabric and travel. But I feel sad for the tailors at the lower end of the market who are retiring without any apprentice or son following the same track. And it is always the same story: all the tailors I know in Italy are son of tailors and their children decided to follow some easier professional track. 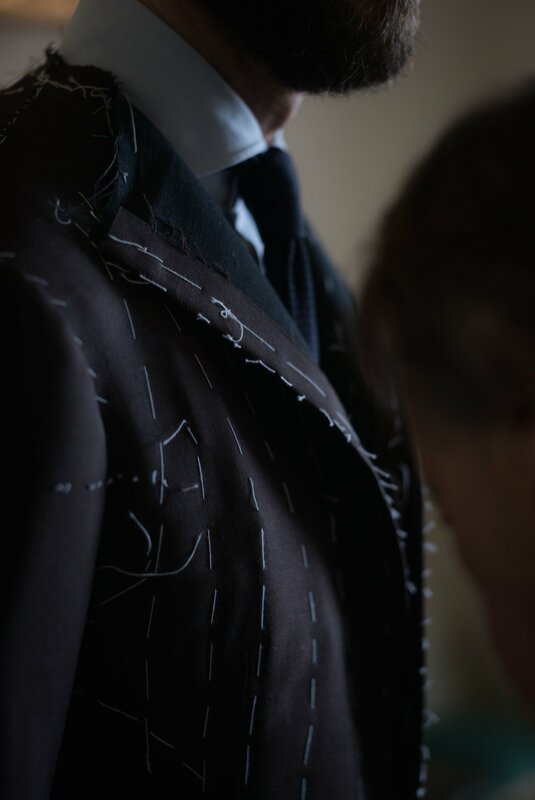 Tailoring in Italy is part of the cultural heritage and should be preserved. The biggest problem is always the consumer – if we buy designer suits, in volume and with higher margins, the bespoke makers don’t stand a chance. Those old makers survived on small margins and low volumes because they had consistency and because rents etc weren’t driven up by other high-end retail. Great choice of cloth colour but article not helped by the underlit photography, perhaps to create mood but I think that more detail is required. Images generally need to be a bit brighter. To make a general point, as the site’s content, organisation and quality has improved I question whether the imagery has. For finished bespoke items images are always too few. I understand that this may sound harsh but with the wealth of highly produced fashion images in print and online consumers are attuned to a certain finish (combining mood, style, detail and an implication of luxury). Retail sites go a stage further; the garment images of Mr Porter for example are some of the best in the business, though I don’t recommend cropping your head its you that makes this site (in all ways )! A few small tweaks in Photoshop might suffice but, as a suggestion, when using a new cloth as in this instance let us see more detail of the colour and weave (macro shot/close up) and more of the items construction. Particularly at the pre-finished stage. One last plea when complete please let us see the garment’s line (sans hands in pockets). Sorry to critique but as a fan I thought it worthy of mention. Do you know any good high-twist, 13/14 oz suitings? Congratulations for your new suit; I really love the shade! Thanks for interesting post. It is great to read about Dalcuore as I was considering them for my next bespoke suit. Do you think they could be a valid alternative to better known names such as Orazio Luciano? Thanks, Luca. Great- look forward to reading. Black shoes with a brown suit even if it is a dark shade? 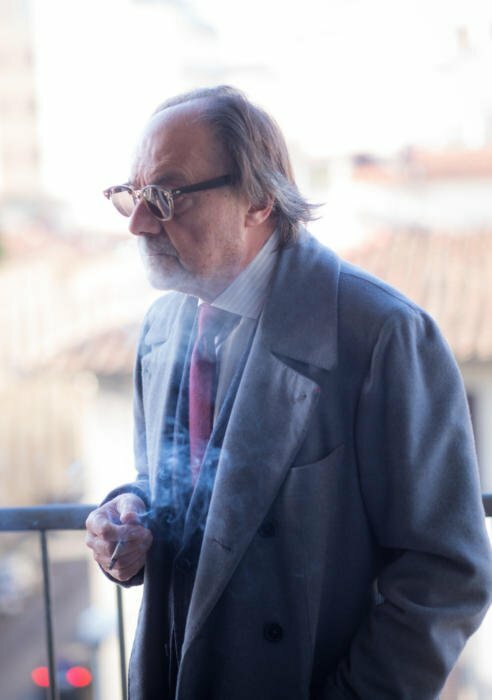 love the jacket that Damiano is wearing in the last pic…any info on that fabric? What’s the weight of the cloth you used for this suit?